It’s important to understand that the camera typically takes longer to autofocus in Live View mode than it does during viewfinder photography. (The difference is because of the type of autofocusing the camera must use when in Live View.) So for the fastest autofocusing response, take the camera out of Live View mode. For times when you opt for Live View, you can tweak the camera’s focusing performance through two settings: Focus mode and AF-Area mode. You can view the current settings at the top of the screen when you use the default display mode. 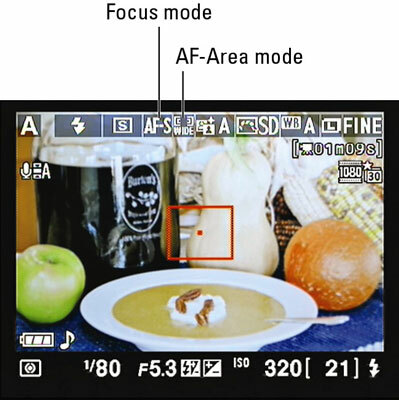 Through the Focus mode setting, you can specify whether you want the autofocus system to lock focus at the time you press the shutter button halfway or continue to adjust focus until you take the picture. Or you can tell the camera that you prefer to focus manually, by twisting the focusing ring on the lens. AF-S (single-servo autofocus): The camera locks focus when you depress the shutter button halfway. AF-F (full-time servo AF): The main purpose of AF-F is to enable continuous focus adjustment throughout a movie recording. Focus is adjusted as needed if your subject moves through the frame or you pan the camera. If you decide to lock focus, you can depress the shutter button halfway. As soon as you release the button, continuous autofocusing begins again. MF (manual focus): Select this option to focus manually, by twisting the focusing ring on the lens. With the kit lens and some other lenses, simply moving the switch on the lens from the A (autofocus) to M (manual focus) position automatically selects the MF Focus mode setting. To adjust the Focus mode setting, press the Info Edit button to bring up the Quick Settings screen. Highlight the Focus mode option, press OK to display the second screen in the figure, and then highlight the setting you want to use. Press OK, and then press the Info Edit button again to return to the Live View display (or just press the shutter button halfway and release it).